These three buildings, are an often overlooked gem of Cathedral Yard. They are situated in the area of Little Stile, one of the seven ancient gateways into the Close. A lease held by the Cathedral Archive states that Edward Leminge is said to have built the Three Gables in 1658. They were on the site of a tenement known as the Workhouse by Little Stile, and sold to him in 1651, through the Parliamentary Commissioners for the sale of lands of Deans and Chapters. The Workhouse was for housing cathedral craftsmen, and storing timber, not a place for the poor. It was not the only workhouse around the Cathedral where timber, lead and other building materials were stored, and workmen lived. The three houses are four storey, single windowed, with plaster fronts over a timber frame, they have cellars lined with Heavitree stone. 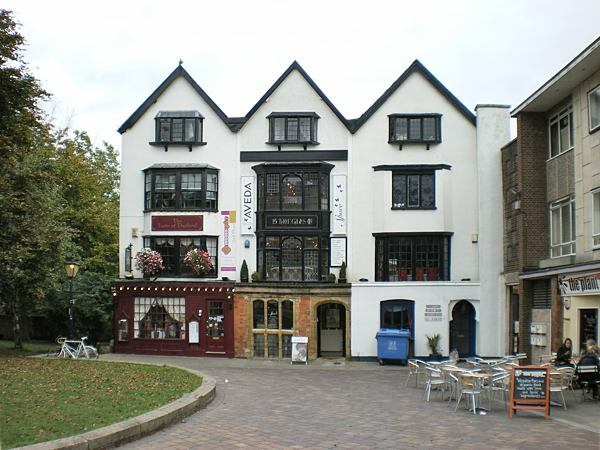 The third floor windows are splayed oriel on brackets, and all windows have leaded lights. They originally had one room per floor, but internally, there have been numerous changes. The side walls are of more recent brick construction. In May 1847, the bakery of Mr Samuel Barrett at no 5 was attacked by a violent mob who stole a quantity of bread during a bread riot, before they went on to damage other property. It was in the same year that the inhabitants of Little Stile, of which, the Three Gables were a part, complained that the area was frequented by prostitutes, after the removal of a gas light. In 1867, the shop was again attacked during a bread riot. By 1878 Matthew Barrett was running the shop and by 1897, it was still a bakery run by Tom Harris. No 5 was the tailors of Samuel Middleweek Hodge in 1878 and 1897. Frederick Drake, lived at no 4 sometime after 1865. 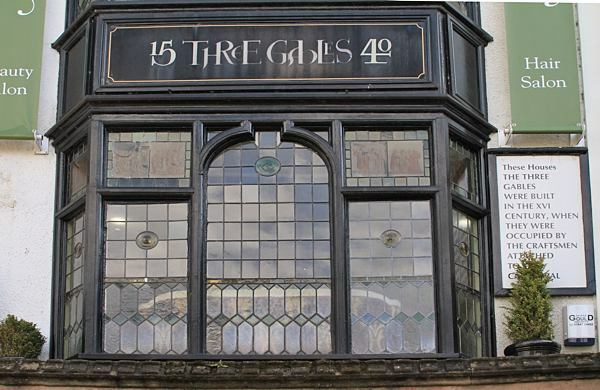 He was a stained glass window maker who was apprenticed, in Exeter, to Alfred Beer in 1852. Drake went on to restore the Great East Window of the Cathedral in 1884 to 1896. He was an important and prolific craftsman, who restored and put in windows into many Devon churches. He transformed no 4, installing a window in limestone from Ham Hill in Somerset. He also added internal oak panelling and a sixteenth-century fire surround. Although Drake died in 1921, the business was still trading through his son Maurice in 1939 from the same premises. 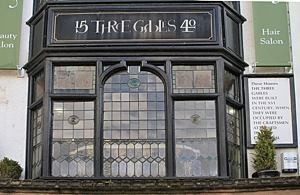 There was until recently, over no 5, a West of England Fire Insurance mark attached to the façade of the building. By 1939, no 5 was the inevitable estate agent, no 4 Frederick Drake and no 3 Henry Stocker and Co., tailors, who had relocated from the High Street in 1925. In 1959 there were solicitors, chartered accountants, Max Peterkin, a photographer and a duplicating and typewriting office working from the buildings. By some miracle, the Three Gables were left standing, in the middle of a sea of destruction, after the blitz. Their neighbours to the west, lining Little Stile, were destroyed, as well as the Globe Inn, immediately to the north-west. Their other neighbour, St Mary Major survived. In the recent past, the top floor of no 3 was the Exeter office of the publishers, Webb and Bower whose book, The Country Diary of an Edwardian Lady was a best seller. They had the original diary on display for a time in the office in the 1980s. Listed building status: 29 January 1953, Grade II. 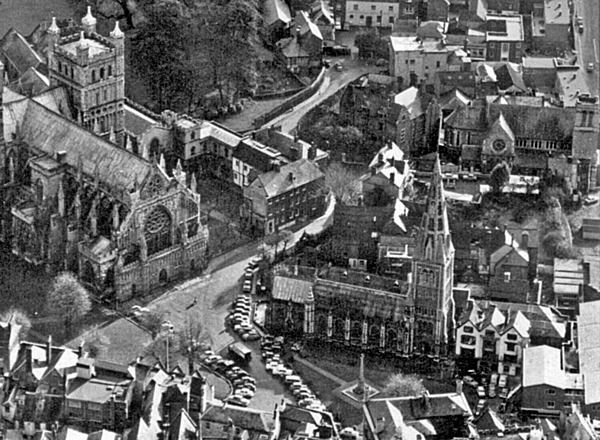 Source: Flying Post, Whites 1878 and Kelly's 1897, British Listed Buildings, Exeter Cathedral Archives Ref ED148. The Three Gables, from the left, 3 4 and 5 Little Stile. The window over the central building. 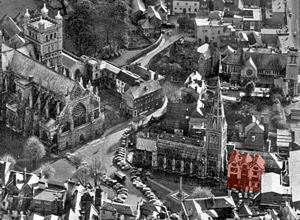 © Adrian Midgley License The Three Gables, in red, before St Mary Major was demolished. Courtesy Express and Echo.